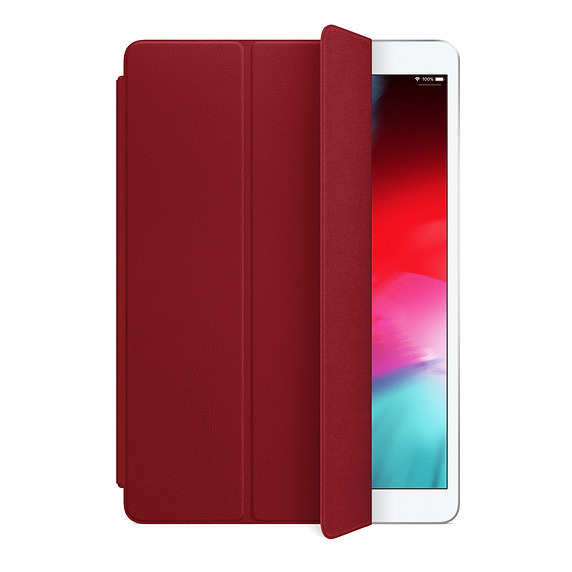 The 2019 leather iPad Air Smart Cover in (PRODUCT)RED. For the 2019 Air, the company has new leather and polyurethane cases. Both feature automatic wake/sleep functions, and their lids can be rolled back to prop an Air in two positions. The standard polyurethane Smart Cover costs $49, and comes in white, papaya, charcoal gray, and pink sand colors. Leather versions are $69 and available in black, red, saddle brown, midnight blue, and (PRODUCT)RED, the last donating a portion of proceeds to the Global Fund, a charity fighting AIDS, malaria, and tuberculosis. For the Mini Apple is only offering a polyurethane Cover, priced at $39. Color options are white, papaya, charcoal gray, and pink sand. 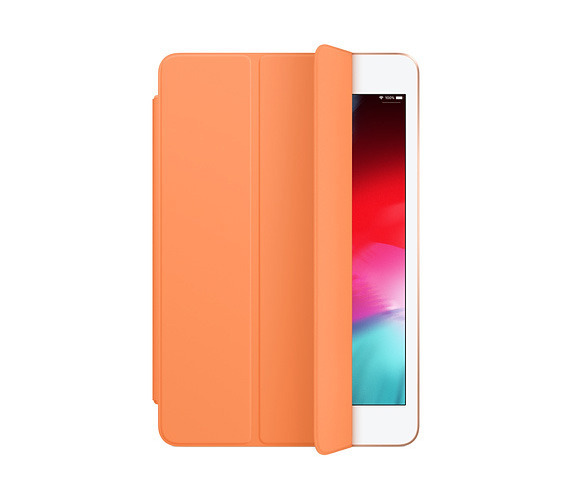 The 2019 iPad mini Smart Cover in papaya. Most of the new case options are only shipping March 20, even expedited — an exception is the leather Air Cover, which may ship today for people quick on the draw. The 2019 Air and Mini are mostly spec upgrades, with A12 processors, True Tone displays, up to 256 gigabytes of storage, and first-generation Apple Pencil support. The Air additionally supports Smart Keyboards.